Community: A place that you can own a piece of, if you employ the help of a local REALTOR®. Some of you real estate experts grew up in the community that you currently work in, you know it intimately. Others moved to a community years ago from elsewhere, and fell in love with it’s many charms. Your personal affinity for your ‘hood, paired with your professional skill-set means that the community you serve should be a major factor in your marketing efforts, both online and off. PS. Wanna skip to the tutorial video? Scroll to the bottom of this page or click here. I’ve personally spent hundreds of hours perusing the websites of various REALTORS® from all across Canada. Your homepages don’t include any visuals or text that speak to the community you serve. Nor do they include any featured listings, office listings, or sold listings that point out your community. In many cases I had to scroll down and read your brokerage address to find out where you’re located. You did not have any Niche MLS® Search pages showcasing up-to-date listings in your community. There were no neighbourhood pages highlighting the sub-areas within your community. Not only does integrating the community in your marketing make sense to human visitors on your website, it also has seriously positive SEO implications. Think about it… the more your website content is community-focused, the more you can expect your website to appear in search engine results for community keywords… both on regular search AND image search! 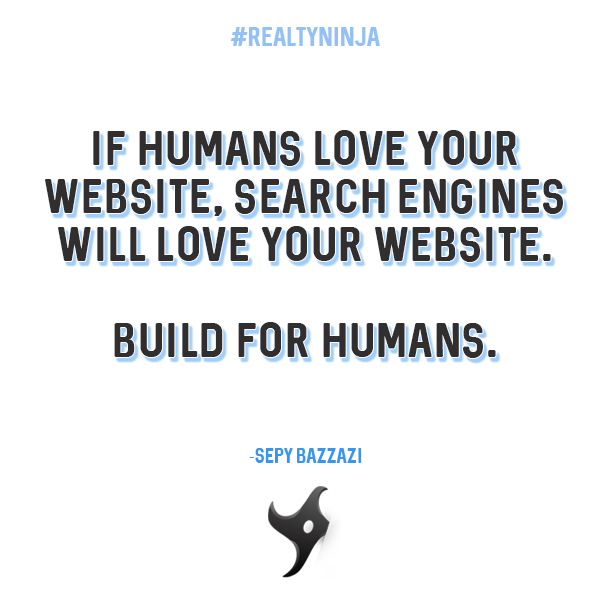 If search engine robots can’t figure out what community your REALTOR® website is representing, then humans certainly can’t. Produce value for people through your website, and you will be rewarded with SEO benefits. There are no shortcuts. Do me a favour, go take a look at your own real estate website, and see if any of the 6 bullets above ring true to you. Most of the above bullets are easy to fix…….. By adding a photo of your community, some keywords that speak to the neighbourhoods you serve, a couple listings to your homepage, and a local-focused blog post, you’ve already pretty much solved bullets 1-4 in one fell swoop. What about bullets 5 and 6? That brings us to today’s Katana REALTOR® website tutorial. Bullets 5 + 6 (niche searches + community pages) are extremely powerful when done right. In the training video below, I’m going to show you how easy (AND FUN) it is to create the ultimate real estate community page on your Katana website. Hope you enjoy the video! If you need any help implementing community pages (or any pages) on your RealtyNinja website, please don’t hesitate to reach out to us via support [at] realtyninja [dot] com. PS. In case you missed it, the other week I released tutorial videos that showed you how to create awesome Parallax sections, and how to create unique real estate landing pages with Katana. Don’t have a Katana REALTOR® site yet? Find out if it’s the right website platform for your real estate business today. Start your unlimited free trial here.